Veronica and Orlando have been together for eleven years. About nine years ago, they were expecting their first child when Veronica was diagnosed with severe preeclampsia. Doctors were forced to induce an early labor to save Veronica. The baby was three months premature and only survived one month. The experience was devastating for Veronica, who was further discouraged when years went by and she was unable to get pregnant again. Finally, after a high-risk pregnancy, Veronica gave birth to her daughter Luciana in 2014. When the baby was just two months old, Veronica began to notice that she seemed to struggle to breathe. Doctors dismissed her concerns, perhaps thinking that Veronica was being overly anxious due to her previous loss. But as her baby became a toddler and then a preschooler, Veronica continued to fear something was wrong. 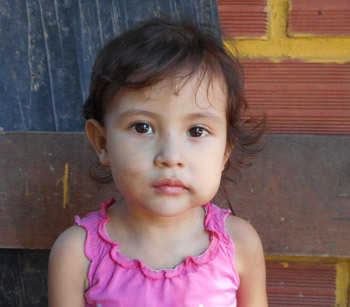 A few months ago, Luciana came down with a strong cold, and didn’t seem to be getting better. That was when doctors discovered that Luciana had a very large patent ductus arteriosus. Veronica went to the public children’s hospital to ask about treatment, but they referred her to private clinics that the family could not afford on Orlando’s income as a bricklayer with a construction crew. Veronica and Orlando were overwhelmed with gratitude after being referred for support through Puente de Solidaridad and the Incor clinic: We are happy now that our daughter is going to be healthy! Luciana’s corrective surgery went smoothly thanks to a high-tech but minimally-invasive cardiac catheterization technique. She is expected to make a full recovery.